New Xylariaceae taxa from Brazil. Pereira J., Rogers J. D. & Bezerra J. L. (2009) New Xylariaceae taxa from Brazil. 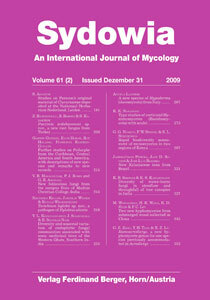 Taxonomic studies of xylariaceous fungi from Brazil revealed the following new taxa: Kretzschmaria aspinifera sp. nov., Stilbohypoxylon quisquiliarum var. microsporum var. nov., and Xylaria papulis var. microspora var. nov.